After pulling away for an 18-stroke win two weeks ago on its home course at The Goodwin, the No. 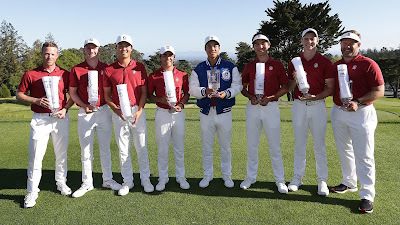 21 Cardinal followed up with a six-shot triumph on Wednesday in the 73rd Western Intercollegiate at Pasatiempo Golf Club. Stanford has recorded 10 team triumphs in the Western dating back to 1947. 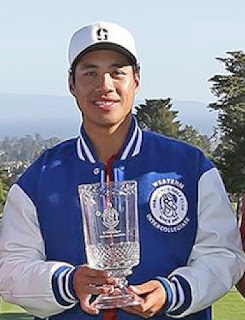 Additionally, senior Isaiah Salinda captured his first collegiate crown, becoming the eighth Cardinal medalist at Pasatiempo. 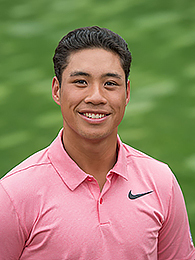 He birdied the par-3 18th hole in regulation to force a sudden death playoff with Sean Yu of host San Jose State, then beat him on the fifth playoff hole by sinking a six-foot birdie putt on the 18th green. Cardinal senior Brandon Wu claimed his first college title at The Goodwin. "Our team definitely made their share of birdies the last two days," Knowles Family Director of Men's Golf Conrad Ray said. "This team just keeps plodding along and I'm really proud of them. Everybody stepped up and made some great shots when it mattered." Ray was thrilled for Salinda, who won the Pacific Coast Amateur Championship and reached the semifinals of the U.S. Amateur at Pebble Beach last summer. "He's had a great career at Stanford and it's special for him," Ray said. "Especially coming at this time of the year." Stanford caught fire the last two rounds in the 13-team tournament on the famed Alistair MacKenzie layout. For the second day in a row, it boasted the low team total, combining for a 10-under 340 to finish at 10-under 1,040 for the three-day event. Cal claimed second at 1,046. Salinda began the final round with a three-stroke advantage and maintained it until the back nine. 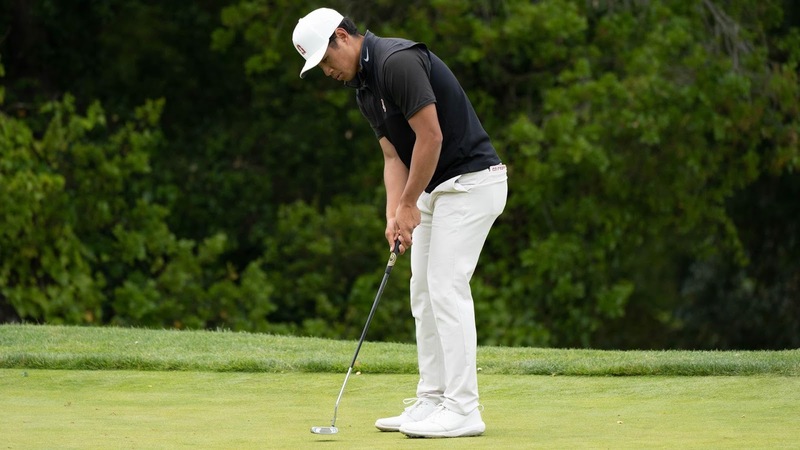 After falling two shots off the pace, he birdied 15 and 16 to regain a share of the lead, bogeyed 17, then stiffed his tee shot at the short but testy par-3 18th, where he calmly holed a testy, four-foot, right-to-left birdie putt. y birdies and fired a 65. He was one of three Stanford players to break par. Junior David Snyder also caught fire on the back side with five birdies and fashioned a 66, while junior Henry Shimp added a 68. 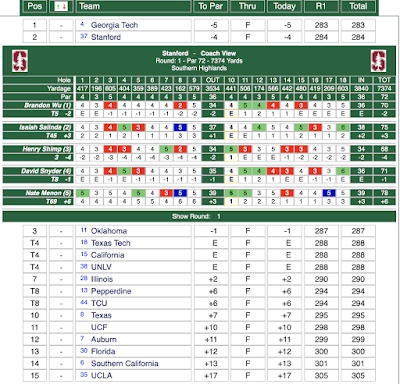 Freshman Daulet Tulebayev contributed a 71 and sophomore Nate Menon shot 73. Wu and Shimp concluded a 1-under 209 and tied for 11th, Snyder wound up at 2-over 212 and knotted for 17th, Tuleubayev wound up at 4-over 214 and tied for 24th, and Menon finished at 218 and tied for 47th. Playing as individuals, freshman Freddie Lee closed with a 69 and tied for 17th, and freshman Ethan Ng added a 70 to share 47th. Stanford resumes competition next Monday through Wednesday at the Pac-12 Championships at Eugene Country Club in Eugene, Ore. The only team to break par in the 13-school tournament, the No. 21 Cardinal compiled a score of 4-under 346 and stands at even-par 700 after 36 holes. 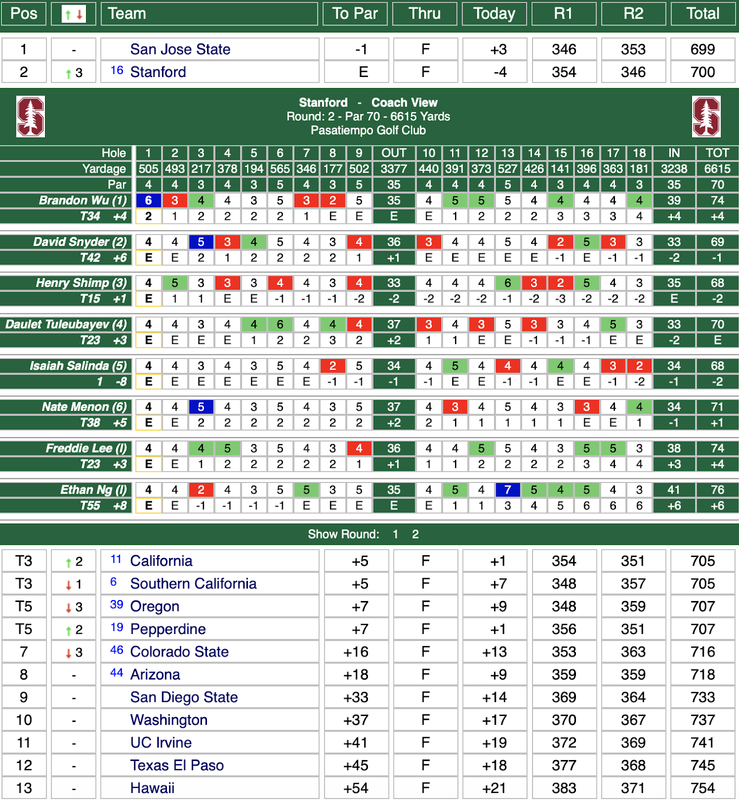 Host San Jose State retained the top-spot at 1-under 699. USC and Cal share third at 705. 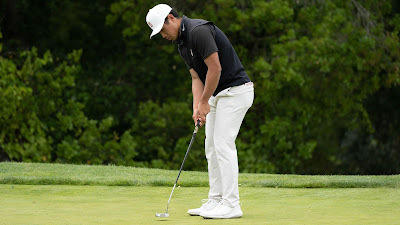 Stanford senior Isaiah Salinda, who began the second round in a three-way tie for first place, earned sole possession with a 2-under 68. Coupled with Monday's career-best 64, he has a 36-hole score of 8-under 132, three strokes ahead of Kevin Velo and Sean Yu of San Jose State, Clay Feagler of Pepperdine and Cameron Henry of USC. "I definitely thought it was a little tougher than yesterday," said Salinda, citing the firm conditions and challenging pin locations. "I kind of had to work for everything." Salinda capped off his day with clutch birdies at 17 and 18. Juniors Henry Shimp (67) and David Snyder (69) also broke par for the Cardinal, while freshman Daulet Tulebayev shot 70. Senior Brandon Wu added a 74. Playing as individuals, freshmen Freddie Lee and Ethan Ng record 74 and 76, respectively. The Cardinal, coming off an impressive 18-shot victory at The Goodwin in its last start, has produced nine wins at the Western Intercollegiate, the last in 2014. Seven Stanford golfers have collected individual titles, Maverick McNealy last accomplishing it in 2016. "At the end of the day, the team win is the most important thing to me," said Salinda, who will seek his first collegiate victory. Stanford begins the final round on Wednesday at 9:42 a.m. and is paired with San Jose State, USC and Cal. 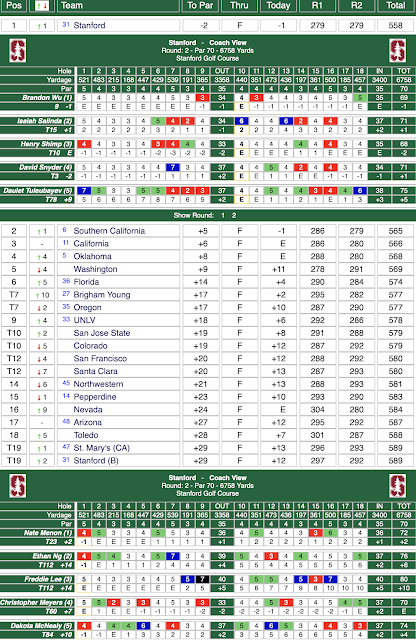 Golf Channel will provide live coverage from 1-4 p.m.
strokes behind the host San Jose State. Salinda's 64, which included six birdies and no bogies, leaves him tied for 1st individually with two other players. Brandon Wu, coming off his first career victory at the Goodwin, posted a solid even par 70. Henry Shimp, despite a triple bogey 7 on his first hole, played even par thereafter to post a 73 which equaled freshman Daulet Tuleubayev's total. Coming in at 4-over 74 was Nate Menon and David Snyder finished with an opening 77. Playing as individuals, freshman Freddie Lee fired a 1-under par 69 and is tied for 9th while another freshman, Ethan Ng shot a 2-over par 72 to sit tied for 31st. 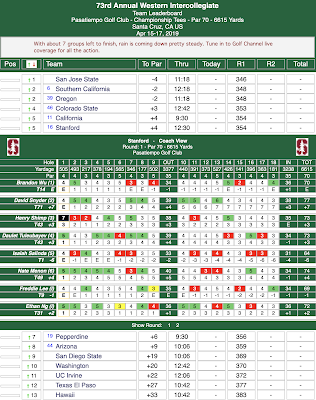 Full scorecards for Stanford are shown below as is the team finishes for round one - click on the image to enlarge. All three rounds will be televised live by the Golf Channel. 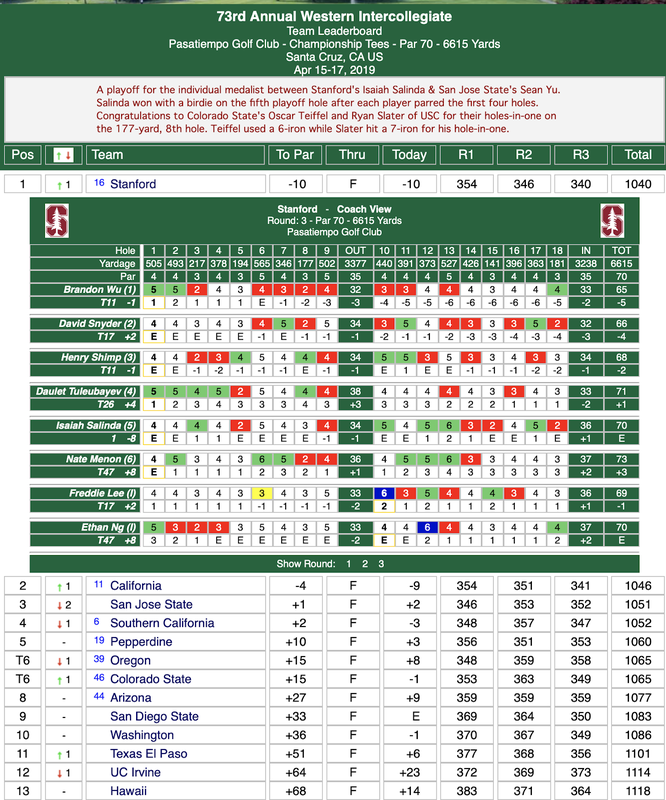 The Cardinal is coming off an 18-stroke victory at The Goodwin two weeks ago at Stanford Golf Course. Senior Brandon Wu won his first collegiate title, edging junior teammate David Snyder on the first hole of a sudden-death playoff. Snyder forced extra holes by draining a 40-foot birdie putt on the final hole of regulation. Pasatiempo Golf Club • Santa Cruz, Calif.
• Since the tournament's inception in 1947, Stanford has produced nine team titles (2014, 1996, 1962, 1955, 1954, 1953, 1952, 1951 and 1947) and seven individual champions in Maverick McNealy (2016), Patrick Rodgers (2012), Cameron Wilson (2014), Rob Grube (2006), Joel Kribel (1999), Chuck Van Linge (1954) and Fred Brown (1952). 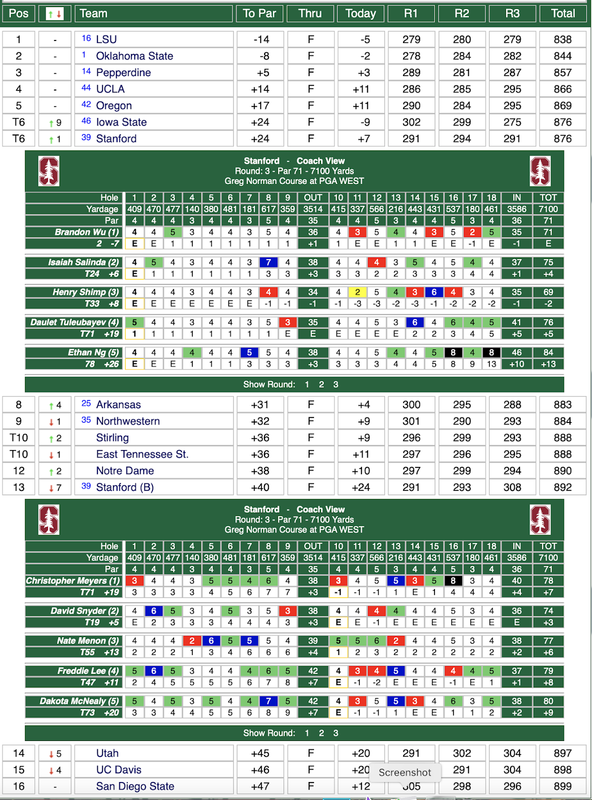 • Live results will be available throughout the event at GoStanford.com, with updates available on Twitter (@StanfordMgolf), Facebook (StanfordMgolf) and Instagram (@StanfordMgolf). • Golf Channel: Monday and Tuesday, 4-7 p.m. and Wednesday, 1-4 p.m.
• The 13-team field is comprised of No. 8 USC, No. 10 Cal, No. 14 Pepperdine, Stanford 21, No. 39 Oregon, No. 45 Arizona, No. 48 Colorado State, No. 61 San Jose State, No. 64 San Diego State, No. 72 Washington, Hawaii, UC Irvine and UTEP. • The event will span three days and features 54 holes of stroke play. Each team will count the best five-of-six scores each day. • There is a 90 percent chance of rain on Monday with a high temperature of 60 degrees. On Tuesday, it will be party cloudy with a high of 65, and on Wednesday it will be sunny with a high of 69. 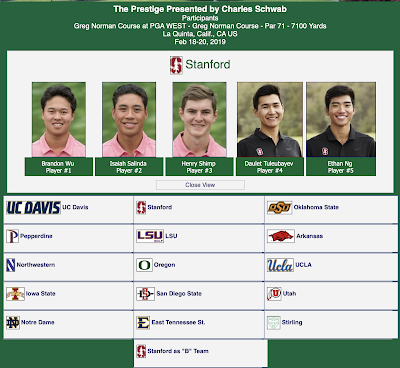 • Stanford will be represented by Brandon Wu, Henry Shimp, David Snyder, Daulet Tuleubayev, Isaiah Salinda and Nate Menon. Ethan Ng and Freddie Lee will compete as individuals. Designed by world-renowned golf course architect Alister MacKenzie in 1929, tree-lined Pasatiempo has hosted the 1986 U.S. Women's Amateur and 2004 U.S. Senior Women's Amateur. It features undulating greens, ocean views and will test every club in your bag. The Cardinal closed with a 6-under score of 274 – the lowest last-day total among 26 competing teams by six strokes – to finish at 8-under 832. No. 7 USC placed second at 850 and No. 4 Oklahoma was third at 854. It marked the 16th Cardinal victory in tournament history, named for former head coach and Stanford Hall of Famer, Wally Goodwin. He was unable to attend, but no doubt the 92-year-old Goodwin had a big smile on his face Saturday night at his home in Arizona. Stanford's last team triumph came in 2017 at The Goodwin. dramatic fashion. Playing one group ahead of junior teammate David Snyder, Wu posted a 3-under-par 67 to finish as the clubhouse leader at 4-under 206. With darkness falling, Snyder poured in a 40-foot birdie putt on the 18th green to force a sudden death playoff. "He's notoriously the best putter on the team," said Wu. "We all had a feeling this could sneak in. Phenomenal putt, dead-center." Wu won on the first extra hole and said it was worth the wait to win his first title in his last regular-season home event. "It' so special," he said. "We only get to play at home once a year, so it's an awesome experience. Beyond that, it was cool to see all your teammates and Stanford family come out to watch and support you." Conrad Ray, the Knowles Family Director of Men's Golf, called it a storybook ending. "To have a guy have so many close calls and a great career at Stanford over the course of four years and play in almost every tournament and have his first win come in The Goodwin in the 50th is a pretty special deal," said Ray. "He'll remember that the rest of his life and we will, too." In his previous two starts before The Goodwin, Wu finished third at the Southern Highlands Collegiate and placed second at The Prestige. He became the Cardinal's 16th individual champion, the first since Maverick McNealy in 2015. 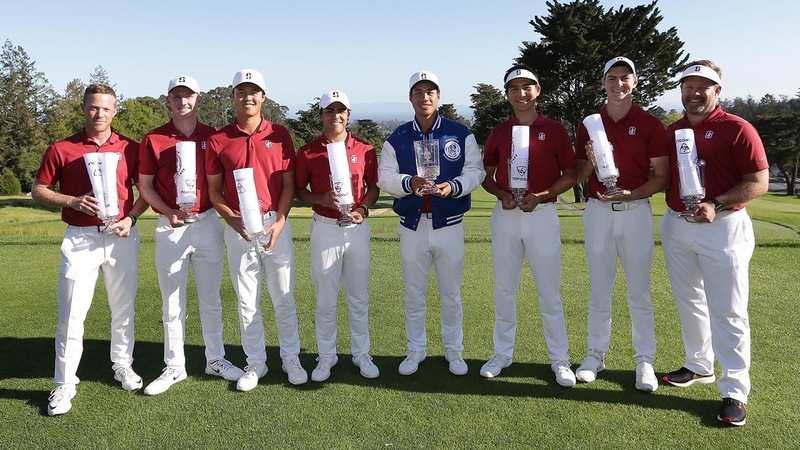 Saturday's victory was the first by a Stanford player since 2016, when McNealy captured the Nike Collegiate Invitational. That earned him a share of the program's all-time win record of 12 shared by Tiger Woods and Patrick Rodgers. Competing against a strong field, the Cardinal received contributions from throughout the lineup in the 54-hole tournament. Wu, Snyder (second) and senior Isaiah Salinda (sixth) secured top-10's. "I really believe in this team and I've been saying it a lot," Ray said. "Sometimes that's the hardest part because you have to convince these guys they can play. Hopefully, we can ride the momentum." Junior Henry Shimp tied for 45th and freshman Daulet Tulebayev tied for 60th. The White team earned a share of 19th and was led by sophomore Nate Menon (t-29). Stanford returns to competition April 15-17 at the Western Intercollegiate hosted by San Jose State at Pasatiempo Golf Club in Santa Cruz, Calif. The tournament will be televised by Golf Channel. The Cardinal put together a best four-out-of-five total of 1-under 279 on Friday morning, matching Thursday's finish and has a 36-hole score of 2-under 558. Washington is second at 565 and Cal is third at 566. The three schools will play together in Saturday's final round. "Excited about our chances tomorrow," said Conrad Ray, the Knowles Family Director of Men's Golf. "A great opportunity to build on our spring campaign and gain experience against high quality teams. The goal is stay aggressive and play how we know we can. The results will take care of themselves." Individually, three Cardinal players reside in the top-10 and four are in the top-15. 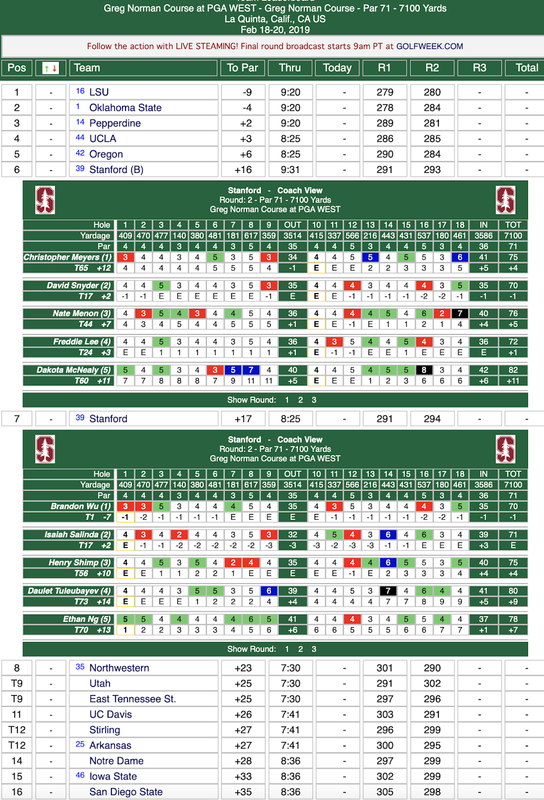 Playing in cool, damp conditions, Stanford received sub-par rounds from junior Henry Shimp and senior Brandon Wu on Friday. Shimp posted a squad-best 2-under 68 and Wu birdied his last hole – the par-4 ninth – to secure a 69. Junior David Snyder, the first-round co-leader and senior Isaiah Salinda, added 71's, while freshman Daulet Tulebayev shot 75. Shimp birdied two of his final four holes, while Tuleubayev fought back from a rough start to birdie his last three. Individually, Snyder is tied for third at 2-under 138, while Wu is ninth at 1-under. Shimp is tied for 10th at even-par and Salinda has a share of 15th at 1-over. Tuleubayev is tied for 78th. 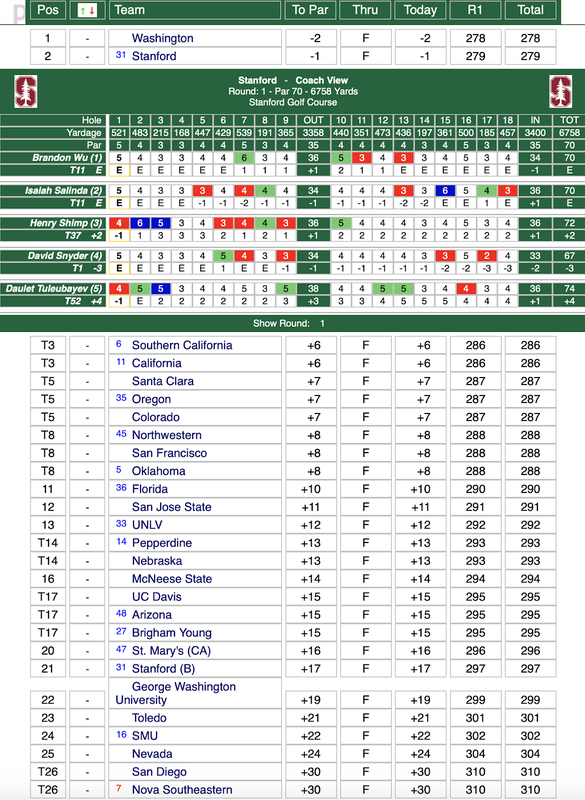 Kaito Onishi of USC is the individual leader at 5-under 135. He holds a two-stroke cushion over Collin Morikawa of Cal. Two Stanford teams are competing. The White squad is tied for 19th at 29-over 589. Junior Nate Menon (72) is tied for 23rd at 2-over and senior Christopher Meyers (70) is tied for 60th at 7-over 147. Junior Dakota McNealy (74) is tied for 84th at 10-over, followed by freshmen Ethan Ng (76) and Freddie Lee (80) at 14-over. 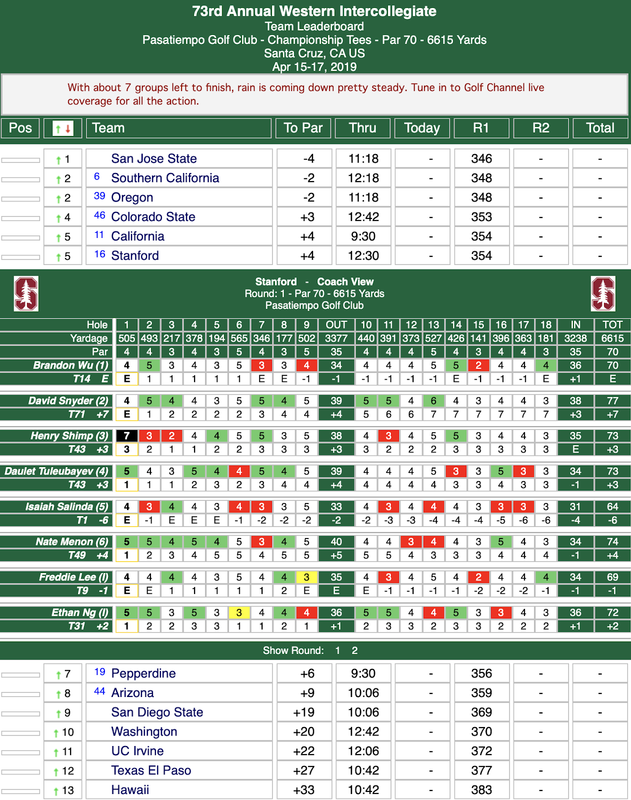 Stanford has won a tournament-record 15 times, earning team titles in 1968, 1970, 1971, 1972, 1973, 1974, 1975, 1980, 1983, 1989, 1995, 2007, 20013, 2014 and 2017. The Cardinal starts Saturday on the first tee from 1:50 p.m. to 2:34 p.m. The White team goes from 7:30 a.m. to 8:14 a.m. off No. 1. Morning rain softened the already wet and newly renovated course, making it play longer than its listed 6,758 yards. Thick rough, afternoon breezes and light sprinkles added to the difficulty. Early starter Washington posted the best round of the day with a 2-under total 278, while the Cardinal led the afternoon wave. The 27-team field includes two contingents from Stanford – the Cardinal and White teams. The latter is 21st at 17-over 297. Junior David Snyder sparked the Cardinal by matching his career-best score in relation to par with a 3-under 67, forging four birdies and only one bogey. He finished strong, securing birdies at the par-4 15th and par-3 17th holes and shot a 2-under 33 on the back side. Snyder shared the first-round lead with Derek Ackerman of Santa Clara and Daniel O'Loughlin of Colorado. 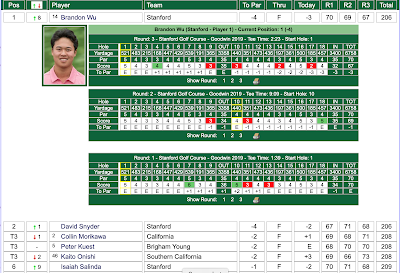 Stanford senior Brandon Wu continued his good play with a 70, tallying two birdies and two bogeys to earn a share of 11th with senior Isaiah Salinda. The latter also carded four birdies and saved his best for last, holing a lengthy putt from off the green at the par-4 18th. Junior Henry Shimp rebounded from two early double-bogeys with four birdies to post 72 and is tied for 37th, while freshman Daulet Tuleubayev added a 74 is tied for 52nd. The White team was led by junior Nate Menon with a 70 (t-11), thanks to an eagle at the par-5 16th hole. 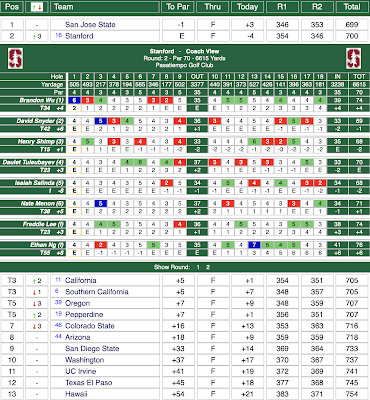 Freshman Freddie Lee shot 74, junior Dakota McNealy 76, senior Chris Meyers77 and freshman Ethan Ng 78. No. 4 and defending team champion Oklahoma is tied for eighth. Second round play begins Friday at 7:30 a.m. PT on the first and 10th tees. The afternoon wave starts at noon. The tournament is open to the public and admission is free. The Cardinal squad tees off No. 10 from 8:25 a.m. through 9:09 a.m., while the White group goes off No. 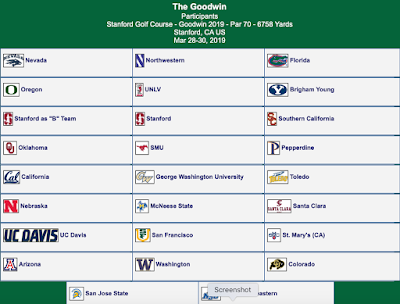 1 from 1:50 p.m. to 2:34 p.m.
• Stanford will play host to The 50th Goodwin (March 28-31) at Stanford Golf Course. 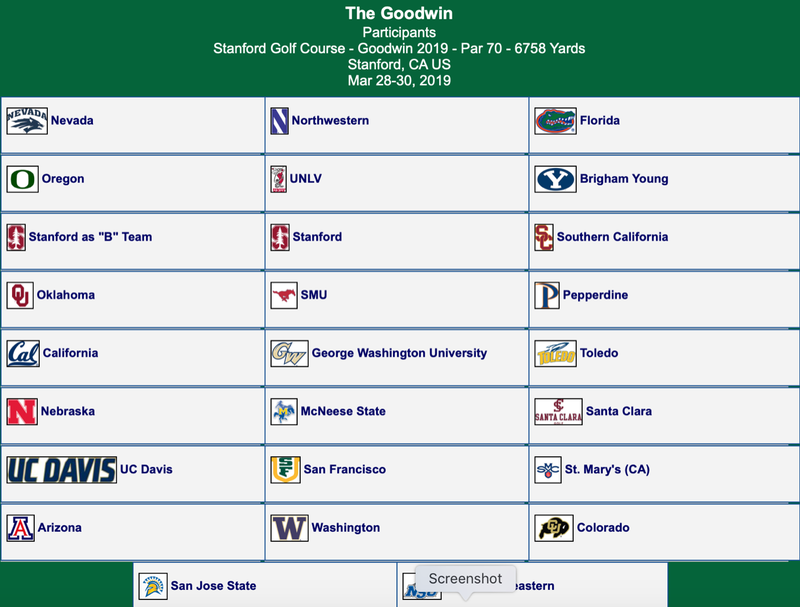 • Originally called the United States Intercollegiate, the event was renamed 'The Goodwin' prior to the 2014 edition in honor of former Cardinal head coach Wally Goodwin. He coached at Stanford from 1987-2000, and his tenure was highlighted by winning the 1994 national title. Goodwin was named national coach of the year in 1992 and 1994, and was inducted into the Stanford Athletics Hall of Fame in 2018. 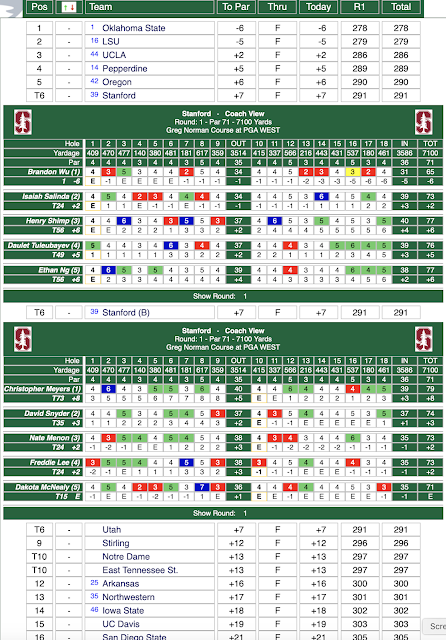 • Goodwin recruited and coached standouts such as Tiger Woods, Casey Martin, Notah Begay III, Patrick Rodgers, Joseph Bramlett, Joel Kribel, Rob Grube and current Stanford head coach Conrad Ray, among many other stars from Stanford's proud golfing tradition. • Stanford has claimed 15 team victories and 15 individual titles at the event, the most of any program in each category. The Cardinal captured the first team and individual titles in 1968 during the inaugural year of the tournament. 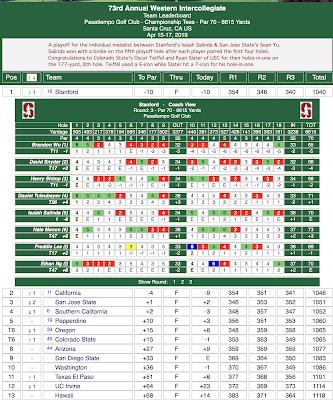 • Stanford alumni who have won the event include Sandy Adelman (1968), Gary Vanier (1970), Tom Watson (1971), Conrad Nilmeier (1973), Dave Baskins (1974), Mike Peck (1976), Mike Milliken (1990), Casey Martin (1995), Joel Kribel (1996-97), Philip Rowe (2002), Rob Grube (2006-07) and Patrick Rodgers (2014). • The Cardinal holds the event's longest team winning streak at six (1970-1975). • The 26-team field is comprised of No. 4 Oklahoma, No. 7 USC, No. 9 Cal, No. 13 Pepperdine, No. 31 BYU, No. 32 Stanford, No. 34 UNLV, No. 37 Oregon, No. 41 Florida, No. 42 Nevada, No. 44 Northwestern, No. 47 Arizona, No. 53 St. Mary's, No. 58 San Francisco, No. 60 UC San Diego, No. 61 San Jose State, No. 80 Washington, No. 87 Santa Clara, Colorado, McNeese State, Nebraska, SMU, Toledo, George Washington Nova Southeastern and UC Davis. • No. 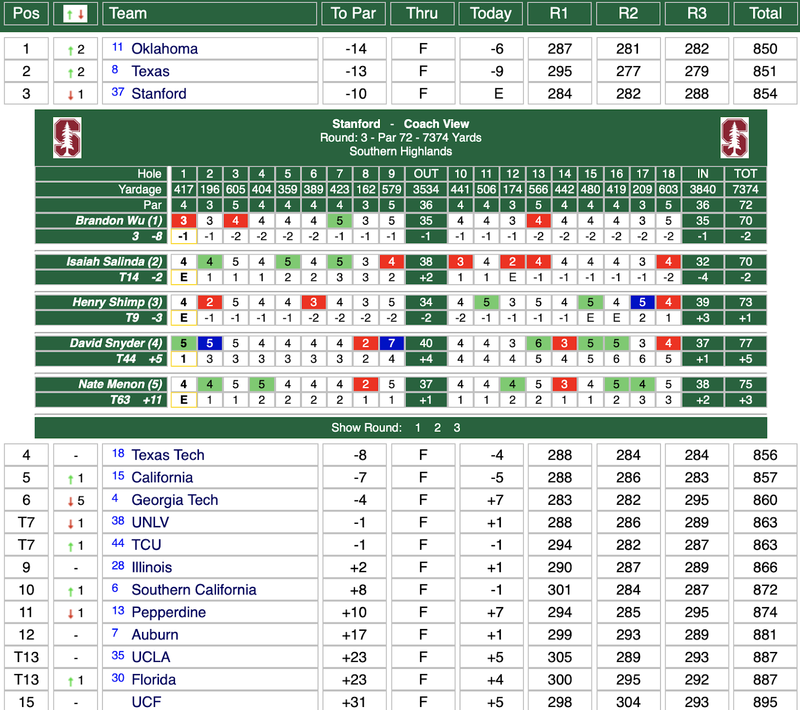 8 Oklahoma combined for an impressive 54-hole score of 24-under 828 to claim the team title by three strokes over No. 10 Cal at Harding Park Golf Course in San Francisco by posting rounds of 279-269-280. Stanford placed third at 16-under 836. • Norman Xiong of Oregon fashioned rounds of 65-65-68 to capture the individual title with a 15-under total of 198. Jeffrey Swegle of Sanford secured a career-best runner-up finish at 9-under 204 and fired an 8-under 63 in the first round, matching the fifth-lowest score in program history. • The event will span three days and features 54 holes of stroke play. Team scores will consist of the cumulative total of its four best scores out of five per round. For the purposes of tournament honors and awards, ties will be split per NCAA Championship tie-breaking procedures. • There will be morning and afternoon sessions each day with starting times off the first and 10th tees. The first session starts at 7:30 a.m. PT and the afternoon wave begins at 12:00 p.m. on the first tee and 12:25 p.m. on the 10th tee. • Pairings remain the same for the first two rounds. Teams will be repaired Saturday according to scores. • The tournament is open to the public and admission is free. • Stanford will compete with two teams. The Cardinal (A) group starts off No. 1 on Thursday from 12:55 p.m. to 1:39 p.m. and is paired with Oklahoma and USC. The White (B) squad starts off No. 1 from 1:50 p.m. to 2:34 p.m. and is paired with UC San Diego and Nova Southeastern. 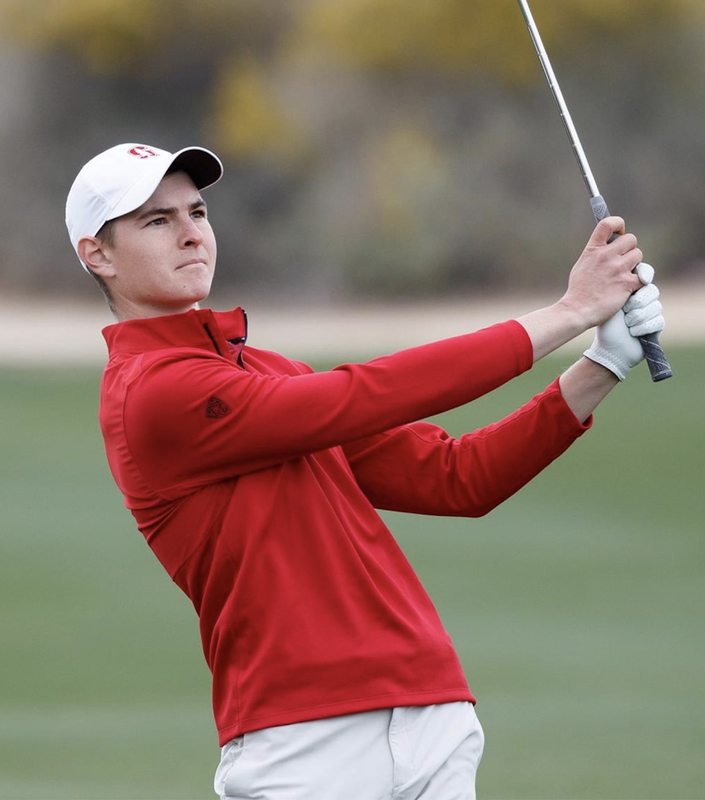 LAS VEGAS – Hanging tough against a talented field that included seven of the top-25 teams in the country, Stanford pocketed its best finish of the season Tuesday by placing third in the Southern Highlands Collegiate at Southern Highlands Golf Club. The Cardinal closed with an even-par score of 288 to conclude at 10-under 854. Oklahoma won the event at 14-under 850, while Texas took second at 851. "Nice finish against a very strong field," said Conrad Ray, the Knowles Family Director of Men's Golf. "We got off to a slow start but hung in there and had a chance to win with five or six holes left." 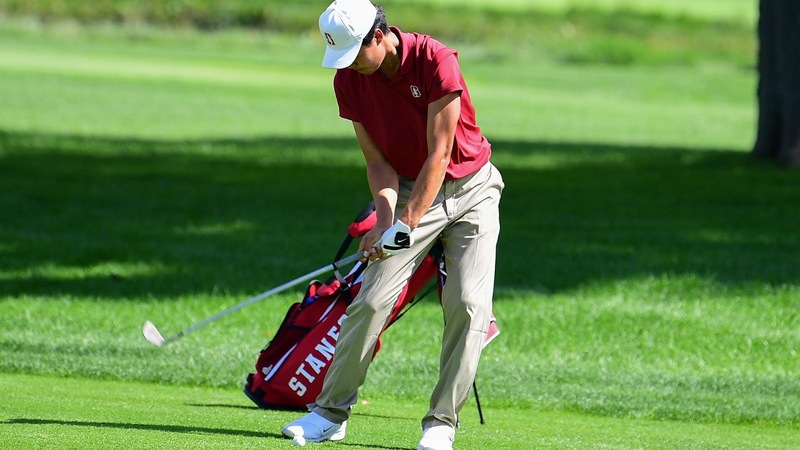 Senior Brandon Wu and junior Henry Shimp collected top-10's for Stanford. Wu fired a 2-under-par 70 in the final round to secure third at 8-under 208, and Shimp shot 73 to garner a tie for ninth at 3-under 213. It marked Wu's second consecutive top-3 showing. Last month, he matched his career-best finish by securing second at The Prestige Presented by Charles Schwab. "Another close call for Brandon and a solid week for Henry," Ray said. "It was great to see both play well and lead us." Cole Hammer of Texas and Jack Trent of UNLV tied for medalist honors at 10-under 206. Trent won the title on the third playoff hole. Cardinal senior Isaiah Salinda saved his best for last. He blitzed the back nine in 4-under 32 and posted a 70 to tie for 14th at 2-under 214, notching five birdies on the day. Salinda and Shimp birdied the par-5 18th hole. Junior David Snyder (77) tied for 44th at 5-over 221 and sophomore Nate Menon (75) tied for 63rd at 11-over 227. 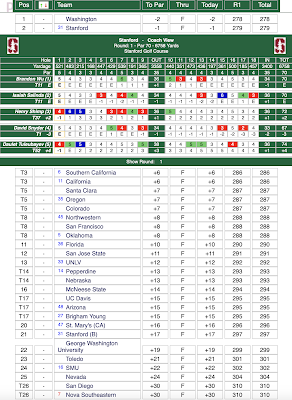 Final Round Scoring below - click on image to enlarge. 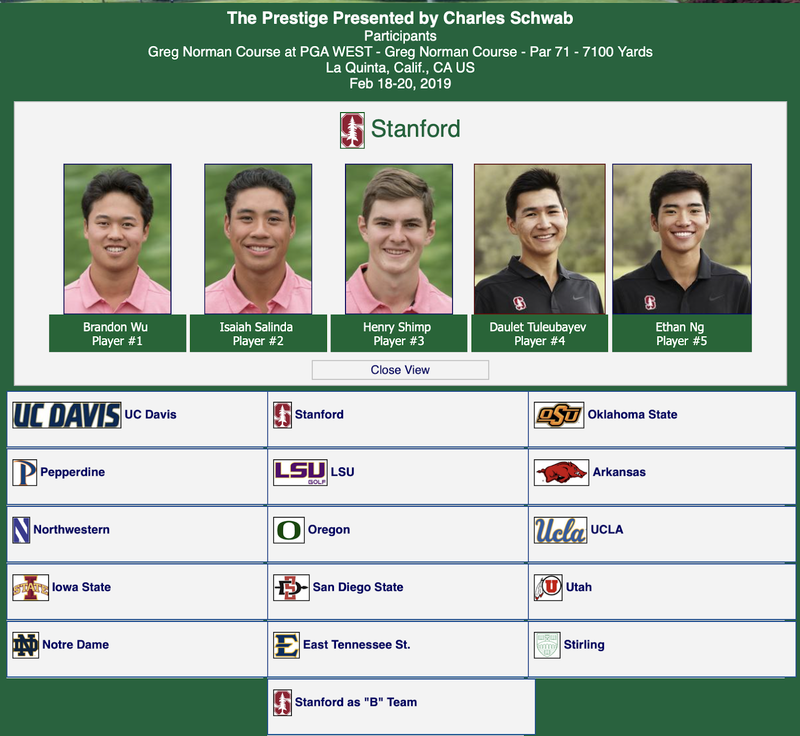 The Cardinal returns to competition on March 28-30 when it hosts the 50th edition of The Goodwin at Stanford Golf Course. Named after former head coach Wally Goodwin, who was inducted into the Stanford Athletics Hall of Fame last year, 26 teams will compete in the 54-hole event. Seniors Brandon Wu and Isaiah Salinda bettered par to help Stanford maintain second place on Monday in the second round of the Southern Highlands Collegiate at Southern Highlands Golf Club. Wu posted a 4-under-par 68 and Salinda a 69 to help the Cardinal shoot 6-under 282, a two-stroke improvement from Sunday's strong opening round. Both registered five birdies. 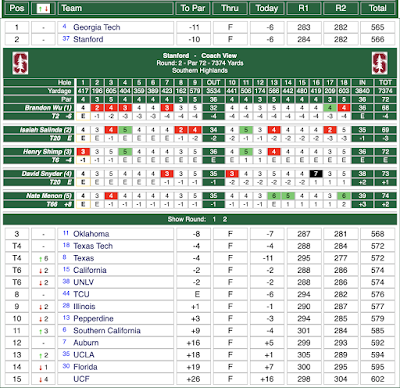 Stanford has a 36-hole score of 10-under 566 and trails Georgia Tech by one shot in the 15-team tournament. Oklahoma is third at 568. Wu blitzed the front nine with a 4-under 32, fashioning consecutive birdies at No. 2, 3 and 4. He finished strong, sinking a lengthy right-to-left birdie putt at the par-5 18th hole. Wu and Parker Coody of Texas share second individually at 6-under 138, three strokes behind Jack Trent of host UNLV. Salinda had three birdies on the front side, going back-to-back at No. 8 and 9 to forge a 2-under 34. He's tied for 20th with teammate David Snyder (73) at even par 144. Junior Henry Shimp continued his outstanding play. He followed up Sunday's 68 with a 72 and is tied for sixth at 4-under 140. Sophomore Nate Menon (74) is tied for 66th. The final round will be live streamed on Golfweek.com starting at noon PT. 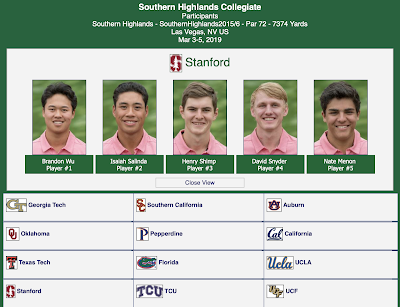 Sunday's opening round of the Southern Highlands Collegiate at Southern Highlands Golf Club. The Cardinal combined for a score of 3-under 285 in the tough, 15-team field. 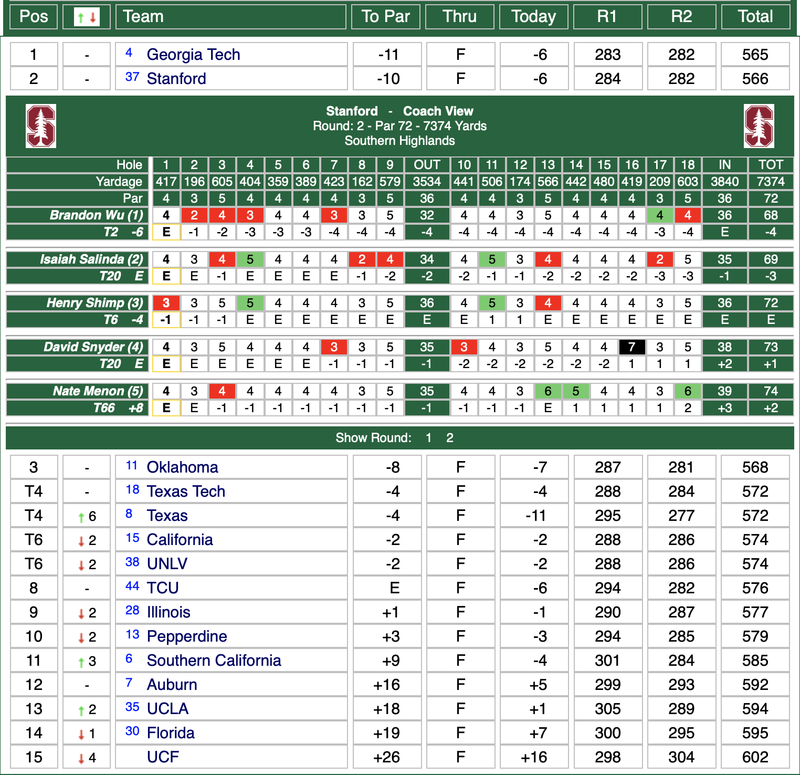 Georgia Tech leads at 5-under 283. Shimp collected three birdies on each side and posted a pair of 2-under 34's, going back-to-back at No. 3 and 4 and 14 and 15. He is third individually. His previous low score was 69 last year in the second round of the Golf Club of Georgia Collegiate. Junior David Snyder recorded five birdies and senior Brandon Wu had three to shoot 1-under 71's and they share seventh. Senior Isaiah Salinda (75) is tied for 45th and sophomore Nate Menon (78) is tied for 69th. Noah Norton of Georgia Tech and Jack Trent of UNLV lead the medalist race after posting 67's. The second round will be played on Monday, followed by the final round Tuesday. 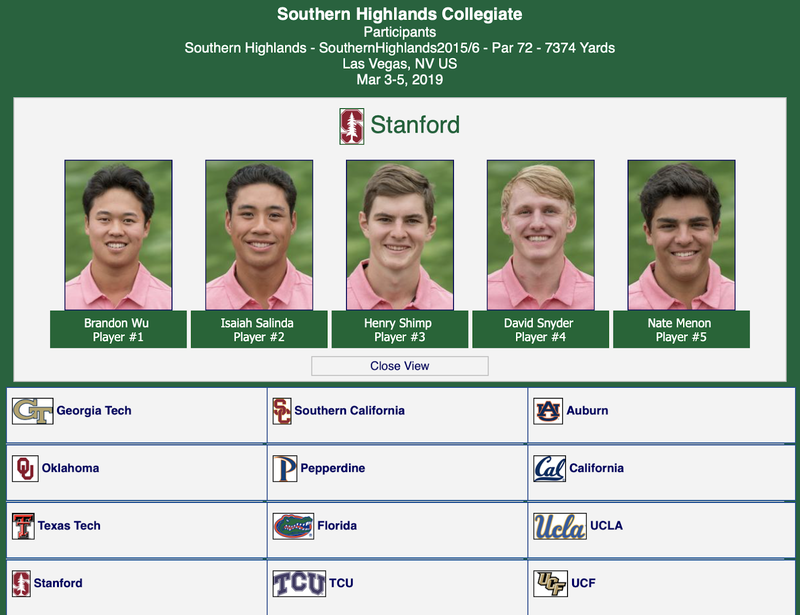 Live streaming begins at noon PT at https://golfweek.com/2019/02/28/southern-highlands-collegiate-livestream/-.